Just got back from seeing Catfish. Yes, I went to see a movie by myself on a Saturday afternoon on alumni weekend. Would you except anything less? Anyway, the film is a documentary and not just a film shot in the cinema verte (i.e. Cloverfield, Blair Witch Project) style like I had originally thought. The editing was really what made the movie. 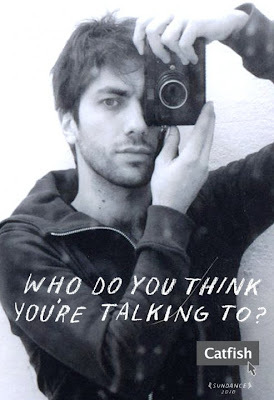 The subject, 20 something New York hipster Nev Shulman, proves to be funny, brave and engaging throughout the entire film, even when things do not seem to be going his way. There are many twists and turns and I would love to talk about it and go on and on but there's not much I can say without taking away from the experience of the film. For those who are interested in seeing it, I'd say that you ought to go into the theater with an open mind. If you haven't seen the trailer yet, don't bother. Just go see the film without any sort of preconceptions (it will be an entirely different experience, trust me). I would also like to note that it is an incredible coincidence that Catfish came out at the same time as The Social Network. They are two sides of the same coin. One gives a realistic account of the creation of Facebook, while the other gives some incite into what it is like to be a user of Facebook and the social significance of the website. It will be very interesting to look back on Catfish in 10 years as some kind of technological time capsule, as I'm sure we will be in a very different place developmentally as far as social networking is concerned. If you are interested in documentaries, definitely watch American Movie, and The Devil and Daniel Johnston. They are the bees knees.